Tours of the Foundation are available by appointment. Most of our tours are on Saturday mornings, but with at least a week’s advance notice, we can occasionally do a tour on another day. We ask a donation of $10 per person to help recoup some of the cost of the insurance policy that allows us to do our programs. Please contact us to schedule a tour today! Though we are not able to show the wild animals directly to the public (our goal is to release animals that are not accustomed to humans), there are still many great things to see when you visit! Tour participants get to meet our resident wolf hybrids, bobcats, fox, raptors, rabbits, ferrets, domestic birds, and reptiles. During your tour, you will get to see many of our rehab buildings, including our large flight pens, where you might get a glimpse of an eagle or other bird. If you are lucky, you may even get to peek at a beaver, bear, or mountain lion through the window! Our classroom is full of fun things to learn about! 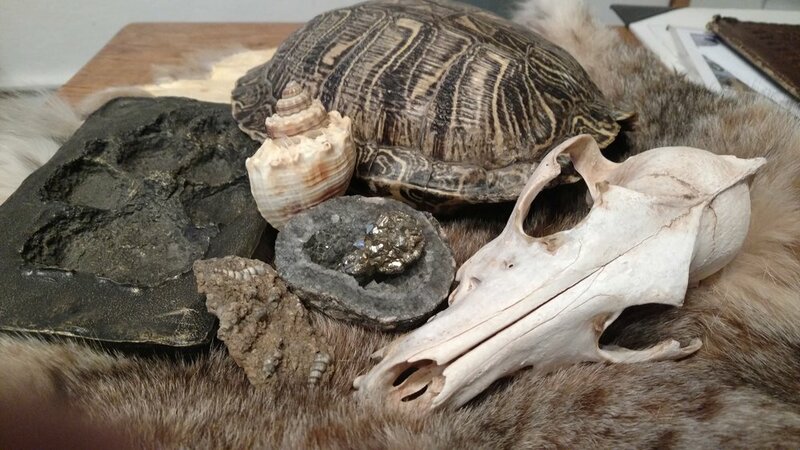 Skulls, shells, hides, antlers, feathers, and other items line the walls. Tours can also include a stop at our homestead museum, which houses hundreds of family heirlooms from the Schneegas and Limbach families.